Las Vegas is full of incredible wedding venues — take a look at some of our favorites. 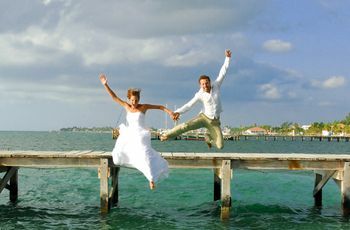 No two weddings in Las Vegas are alike, which is exactly what makes the city such a memorable place for your nuptials. 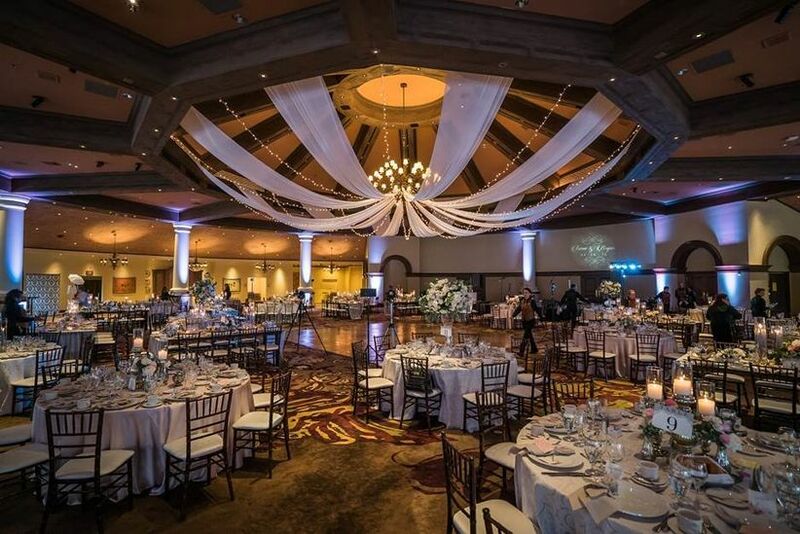 Las Vegas has venues for every style and budget, whether you’re looking for a traditional ballroom or something downright unexpected, but choosing the right venue will make all the difference when it comes to creating an unforgettable experience for your guests. We’ve selected some of the top Las Vegas wedding venues to guarantee that everyone (including you!) has the time of their lives. Here are the most wow-worthy Las Vegas wedding venues. There’s no better way to achieve the ultimate Las Vegas wedding than by choosing a venue with skyline views. Whether you’re going for an ultra-modern vibe at a trendy rooftop terrace or want to take your guests’ breath away by treating them to a bird’s eye view of the Strip, these spaces are completely awe-inspiring. An outdoor terrace on the 17th floor at the Platinum Hotel & Spa gives you incredible views of the Las Vegas Strip and the surrounding mountains in the distance. We envision this incredible space, which overlooks the High Roller among other famous Las Vegas landmarks, for an intimate ceremony as the sun is setting. The Vivace Rooftop at Enclave is the perfect combination of glitz and romance, with strands of bistro lights hanging above a spacious brick-paved courtyard with an adjoining indoor banquet room. At the Vivace Rooftop, you’ll have equally impressive panoramic views of Las Vegas, from Downtown to the Strip. 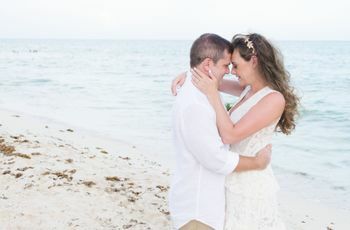 Couples who want everything in one place for their wedding day — venue, accommodations, catering, etc. — should check out some of Las Vegas’ top hotels. 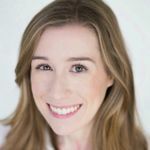 These venues offer countless perks for you and your guests, especially if you’ll be traveling from out of town. The JW Marriott Las Vegas Resort & Spa features several different wedding venue options for groups both small and large. 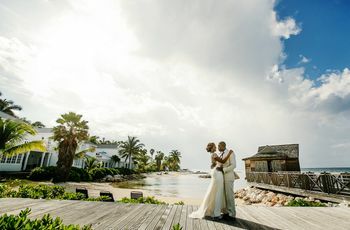 Couples can choose from a quiet garden gazebo, traditional wedding chapel, Mediterranean-inspired terrace, and more at this timeless hotel. For the ultimate in luxury and sophistication, you can’t beat the Vdara Hotel & Spa at ARIA Las Vegas. From the hotel’s five-star spa to its glamorous suites and penthouses (you’ll want to spring for a room with a view of the nearby Bellagio fountains), Vdara is sure to captivate you and your guests. 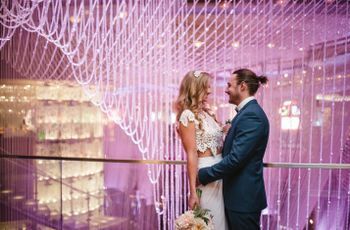 Get married in the ARIA wedding chapel, or host your event on the Vdara pool deck, which offers great panoramas of Las Vegas. Anyone looking to create a once-in-a-lifetime experience will love the Hard Rock Hotel & Casino. At this Las Vegas hotspot, you can get married on the same concert stage that has played host to big-name artists, like Def Leppard, Journey, Elton John, Rascal Flatts, and more. You won’t even have to leave the hotel property to enjoy a wide range of dining options — The Hard Rock Hotel & Casino has a number of restaurants serving all types of cuisine, including Mexican, Japanese, Asian fusion, and American. Las Vegas is unlike any other place in the world, so it’s no surprise that the city is home to some of the most unique wedding venues we’ve ever seen. Treat your guests to a one-of-a-kind celebration by daring to break tradition with these creative ideas. Host your wedding under the sea — or at least give the impression that you’re underwater —with the Seascape Ballroom at Mandalay Bay. This elegant space has four floor-to-ceiling picture windows, giving your guests an up-close and personal view of the living seascape at Shark Reef Aquarium. If you don’t mind sporting a thermal coat during your “I Do’s,” the Minus5 Ice Experience is as unique as it gets, and there are two locations on the Strip (Mandalay Bay and The Venetian Las Vegas). Everything at this venue is made entirely of ice, from the walls to the seats, and even the drinking glasses at the bar. We promise that your wedding guests have never seen anything like it! Couples who prefer warm sunshine over ice sculptures can get hitched in the Las Vegas desert instead. Desert weddings and elopements are ruling the bohemian wedding scene right now, and we’re absolutely obsessed. There’s more to Las Vegas than just glitz and glam, and you don’t have to venture far from the Strip to find beautiful views of the unique Nevada landscape. These venues are ideal for nature-loving couples who want to bring a touch of rustic charm to their Las Vegas wedding. Just a short journey from downtown Las Vegas, you’ll find Southern Highlands Golf Club, a gorgeously serene location with landscaped gardens, babbling waterfalls and an elegant clubhouse. 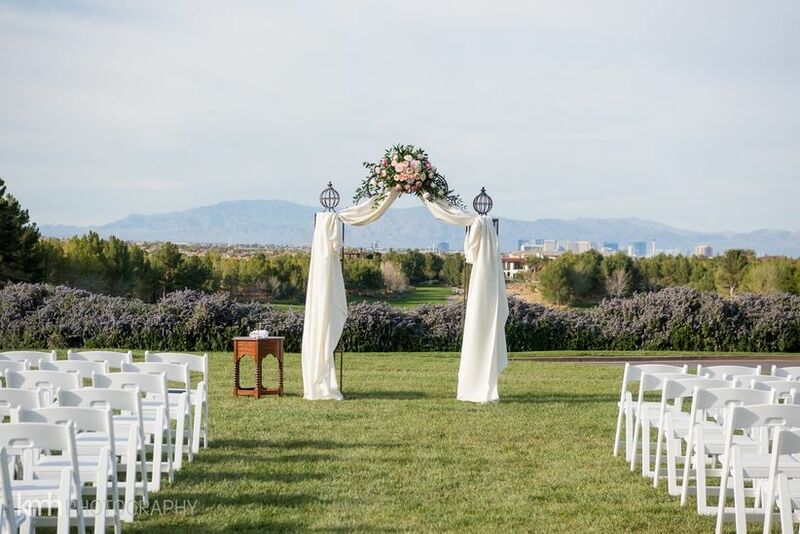 In addition to the outdoor ceremony site that overlooks the Las Vegas foothills, Southern Highlands Golf Club also has a luxury spa, wine tasting room, and several dining rooms where you can enjoy world-class cuisine prepared by the in-house chef. 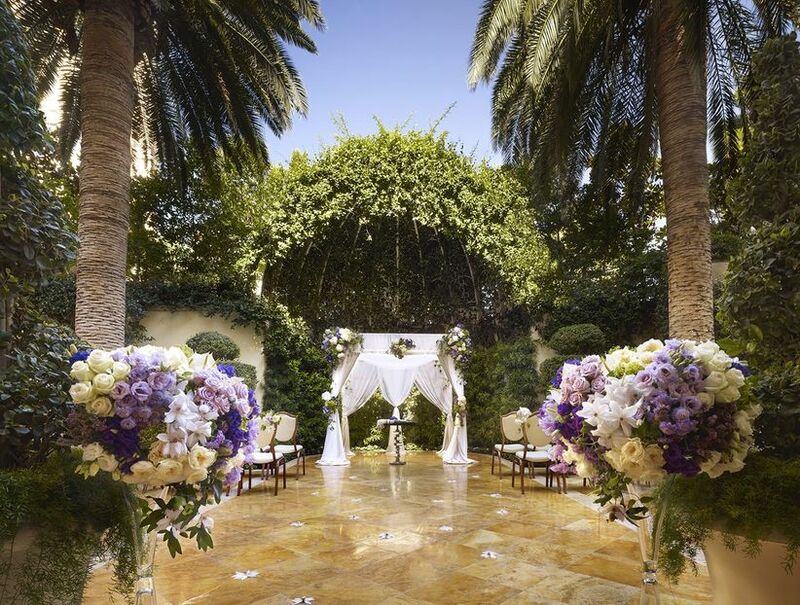 The Wynn Primrose Courtyard is another option we love for outdoor weddings in Las Vegas. This romantic open-air venue features polished stone flooring, tall palm trees, a fountain, arched metal arbor, and ivy covered walls that create a sense of privacy and seclusion. At the Aliante Hotel, an intimate courtyard is a relaxed and inviting option for your outdoor wedding. This venue offers customizable, all-inclusive packages ensuring that your planning process is a breeze, down to the very last detail. Couples who want to travel a bit farther from downtown Las Vegas will love The Resort on Mount Charleston. Located 30 minutes outside of Las Vegas in a majestic mountain setting, this breathtaking venue is an unforgettable backdrop for outdoor weddings big and small. There are plenty of on-site accommodations and amenities at the resort, including a restaurant, lounge, general store, and ski slopes (perfect for winter weddings). We love garden wedding venues for a number of reasons. Their natural beauty sets an idyllic scene for a romantic wedding and allows you to put the focus on the existing details of the space, such as flowers, lighting accents, landscaping, etc. without the need for elaborate decor (unless you want it, of course!). Gardens are a fabulous venue choice for couples who want a wedding that is a classic with a twist. Located just a few minutes from the Strip, A Secret Garden is our top pick for hosting a garden wedding in Las Vegas. You’ll be enchanted by the venue’s outdoor space, which features bistro lights strung throughout the trees to create a fairytale feel after nightfall. There is also a charming ceremony gazebo, outdoor dance floor, and enclosed ballroom should you choose to have an indoor reception. A Secret Garden is an all-inclusive venue, providing in-house catering, event planning, floral design, decor, and beyond — anything to help you avoid unnecessary wedding planning stress! Dreaming of a wedding that’s classic yet totally glamorous? If you want high-end style with a little bit (or a lot) of sparkle, a ballroom wedding venue is for you. Filled with eye-catching details and lavish fixtures, these Las Vegas ballrooms are as fabulous as you are. The Havana Room at The Tropicana is an incredible venue featuring luxe details and contemporary European-inspired design, including large crystal chandeliers, dark wood floors and customizable uplighting throughout the space. The circular room has a sunken dance floor with stylish banquette seating, which can double as a “VIP” area for you and your wedding party. The SLS Las Vegas is our favorite venue if you’re looking for a modern location. The stylish, all-white event spaces at this hotel can be left as-is for a chic look or customized with colored uplighting for something more dramatic. Last but certainly not least, The Cosmopolitan of Las Vegas has several different ballrooms and customizable wedding packages for you to consider. 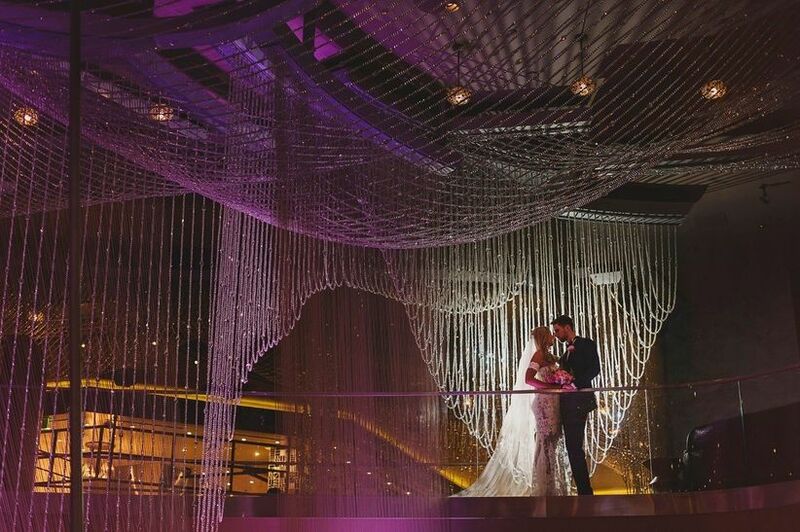 We love this venue for its stunning photo backdrops, including the multi-story chandelier. Weddings with smaller guest lists (or no guests at all) are gaining popularity, and Las Vegas has plenty of options for couples who want a more intimate setting on the big day. If you want to keep things short and sweet, Cupid’s Wedding Chapel is our first recommendation. This charming chapel provides a selection of wedding packages, giving you the freedom to customize your ceremony to the very last detail. A dove release upon your exit from the chapel as newlyweds is the perfect finishing touch — not to mention that it makes a fantastic photo op for your guests in attendance. The Little Neon Chapel has three locations in some of Las Vegas’ most famous areas, including Fremont Street and the Las Vegas courthouse. All you need to do is bring yourself — The Little Neon Chapel will provide wedding dresses, tuxedos, bouquets, beauty services, photography, and even wedding rings.